Childcare places available. Taking applications now. Independence and the power to think are cultivated by taking on challenges for oneself in exciting experiences. We plan various activities in accordance with the age and development of the children and provide opportunities for them to experience, but we emphasize the creation of an environment where children want to try things for themselves rather than being made to do things by adults. We foster the power to think and the joy of creating while allowing children to create and develop their play freely. Impish children, shy children, angry children, crybabies and children with disabilities. Each and every child shines. We respect the idea of “Only One” always and support children so that they can exhibit their own uniqueness. Compassion for others is fostered only by receiving compassion yourself. 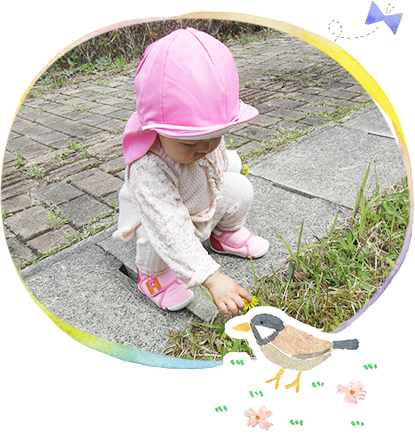 We cultivate the feeling of valuing the environment by developing the children’s interest in nature and things like flowers, trees, insects, animals and water. Eurhythmics is a nursery education program that has attracted a lot of attention in recent years, and is also famous for being studied by Princess Aiko of the Crown Prince’s family. We provide a high level educational program in cooperation with the Eurhythmics Research Center. The children learn in a fun way while communicating face-to-face, enjoying songs and dancing. This is a chance for contact with different cultures and a different language from early childhood and the children can study genuine English. We go out for a walk once a week on a day when the weather is good! We cultivate the feeling of valuing the environment by developing the children’s interest in nature and things like flowers, trees, insects, animals and water, and by coming into contact with nature. We do everything at the nursery, from menu making to food preparation! The nursery provides handmade snacks in the morning and evening. We grow plants in planters. This communicates just how much energy is required from people for the ingredients of the food that is eaten every day to end up on our dining tables. The children acquire the ordinary custom of eating without leaving food behind naturally. Open hours: 7:00 a.m. to 6:00 p.m.